Many travelers experience soreness, pain, and foot fatigue overseas, and it can be especially difficult if you’re wondering how you can possibly head out again tomorrow. Each foot comes into contact with the ground 80 to 100 times per minute on average at a quick pace. These tips will help keep your foot healthy throughout your trek/hike so you can spend your time loving every minute of your outdoor experience. One of the best ways on how to prepare your feet for hiking is to stretch your muscles. You can perform a two-minute stretch beginning from the tip of your toes up to your legs. This is the most obvious suggestion, but also the most important. Every step you take sends a tiny jolt through your feet that is magnified by the weight of your backpack and all your gear. Over the course of a long backpacking trip this can lead to big-time foot pain and injuries like: blisters, shin splints, heel spurs and plantar fasciitis. Reducing your gear weight means less impact on your feet and less foot pain. 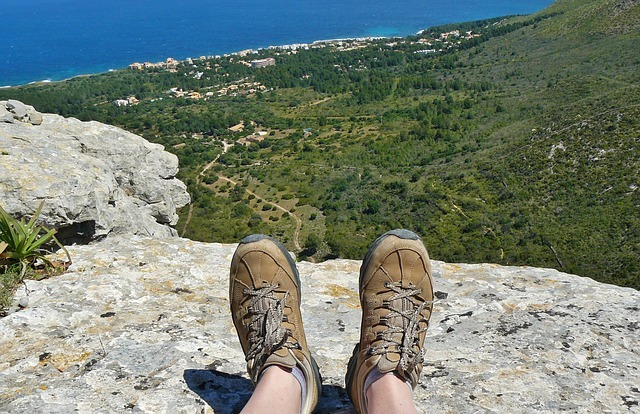 When you stop for a break, take your hiking boots and socks off to let your feet air out and dry off. Make sure to spread your socks out in the sun and remove your insoles from your shoes so any accumulated sweat has a chance to evaporate. When backpacking, bring a pair of lightweight sandals to wear in camp while your boots air. The key to preventing blisters is to eliminate friction. If you feel a hot spot forming on your feet, you should stop to inspect it immediately and apply moleskin or tape to prevent it from turning into a blister later in the day. Some hikers also prefer wearing two sock layers, a liner which absorbs moisture and can be changed frequently, and a heavier outer sock. This moves the site of friction between the socks, away from your skin and a sock. Many people recommend that you elevate your tired feet to prevent swelling, and this also helps to facilitate faster healing of the muscles as well. Try to elevate the feet at a 30-degree angle from your head. You can prop it up on a stack of pillows at night while you are sleeping or reading. The best way to alleviate the pain of tired and sore feet is with a massage! There is one technique that you can try – get a small ball or any hard round object and roll it under, at the top and sides of your foot up to your ankles. By doing this, you’re able to break up the tiny fascia and muscles that have tightened up due to nonstop walking. Good news: The more you hike, the less sore you will feel the next day. Your body becomes efficient and conditioned.